Open Heaven 2 November 2018 Prayer Points on Today – You need a Counselor - Open Heavens Daily Devotional Messages, By Pastor E.A Adeboye. 1. I worship You, the unlimited, self-existing and Sovereign God. 2. You are worthy, O Lord, to receive glory, honour and power, for all things were created for Your pleasure. 3. Thank You, Father, for creating me in Your image and likeness, and for giving me dominion over everything You have created. 4. Father, in anyway I have fallen short of your glory please, have mercy and forgive me, in Jesus’ name. 5. Father, let me never share Your glory with anyone; help me to acknowledge You, in all my ways, in Jesus’ name. 6. Father, You are the my chief-counselor, please, come and override and destroy every limiting factor in my life, by Your Sovereign powers, in Jesus’ name. 7. Father, I surrender and place myself under Your Lordship and authority; please, let me never harden my heart against Your word, in Jesus’ name. 8. Father, because I have submitted to Your Will and Lordship, let sickness, death, curses, debts and other negative prophecies, be annulled in my life, in Jesus’ name. 9. Father, please, help me to live through today, without committing a single sin, in Jesus’ name. 10. Father, restore unto me, all that the devil has stolen from me and my family, in Jesus’ name. 11. Father, provide for, and meet Your son, Pastor E.A. 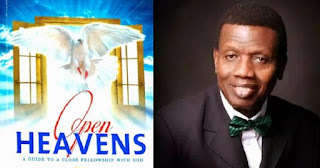 Adeboye, the author of the open heavens daily devotional and general overseer of RCCG, at the points of His needs, daily, in Jesus’ name.